Two journalists who were arrested for the suspected theft of documents from the Police Ombudsman's Office have been questioned again by police. Barry McCaffrey and Trevor Birney were arrested and released last August. Both men presented themselves to Musgrave police station on Friday and had their bail extended for a further six months. The confidential documents relate to a police investigation into the murder of six men in Loughinisland. Mr McCaffrey and Mr Birney produced a documentary about the 1994 killings. The Police Service of Northern Ireland (PSNI) asked Durham Constabulary to conduct the investigation into the alleged theft. Lawyers for the two men say efforts were made by police to restrict their ability to speak about the case. 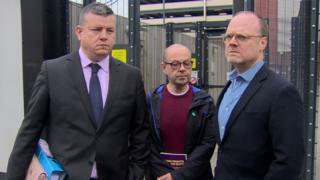 Mr Birney's solicitor Niall Murphy said: "Police today applied for an additional bail condition which would seek to restrict both Trevor and Barry from making public comment in relation to this case." He added: "The application was ultimately refused by the adjudicating sergeant and the position that currently stands is that they have been bailed now for a further six months so that would be a total of one year on police bail for a case that doesn't exist." A Durham Constabulary spokesperson said: "During today's bail extension, Durham Constabulary applied for a condition which sought to prevent the two suspects from discussing the contents of witness statements, which have been disclosed to them during the ongoing Judicial Review." "At no stage today did Durham ask for a condition stopping either person talking about their arrest as has been suggested. These matters were properly adjudicated upon by an independent custody officer."